ABGC had an MLS Draft pick in Los Angeles – Congratulations to Lars Eckenrode our former player, who starts his professional career with Toronto FC. He was the 17th draft pick in round 4. Are You Ready for some Soccer? #GivingTuesday is a global day of giving. Celebrated on the Tuesday following Thanksgiving, Giving Tuesday provides an alternative to shopping events like Black Friday and Cyber Monday, #GivingTuesday kicks off the charitable season, when many focus on their holiday and end-of-year giving. It’s a simple idea. Whether you come together with your family, your community, your company or your organization, find a way to give back. Your donations to the Annandale Boys & Girls Club will help us keep our scholarship program alive. ABGC has proudly committed, over the decades, to ensure that all of our youth have an opportunity to participate, compete and experience the joy of youth sports. You can make that happen. There are two ways you can make a difference for a youth athlete at ABGC. Contribute to our scholarship program. Every dollar contributed to our scholarship program funds the registration fees for qualified Annandale families. Buy an ABGC Gift Certificate. Is there someone in your neighborhood or family you’d like to buy a gift certificate to give as a holiday gift? Choose any amount gift certificate below. You can truly make a difference for a young athlete in our community! Thank you for your contribution to our GivingTuesday campaign. It’s that time of the year when ABGC basketball teams pose for their team and individual pictures. 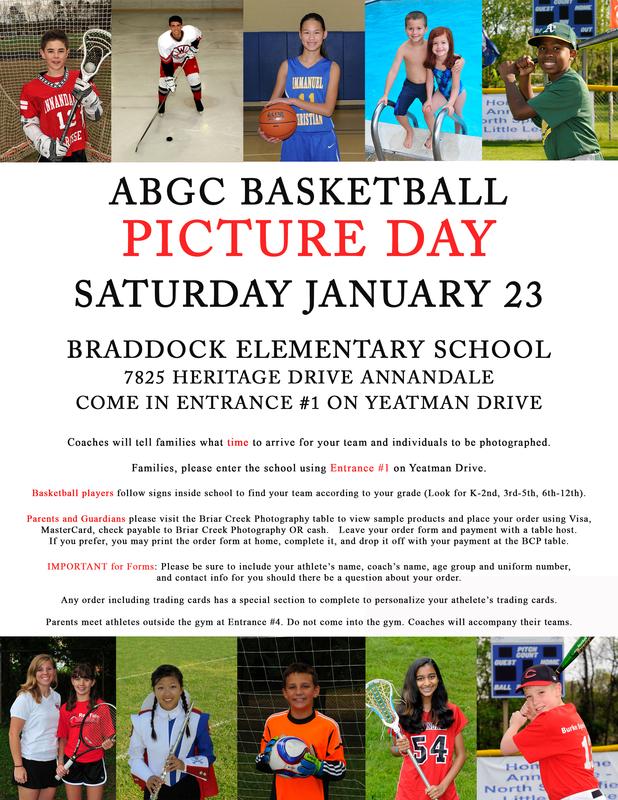 ABGC is happy to announce this year’s photographer, Annandale’s Briar Creek Photography, has a terrific package of items for families to help remember their 2016 basketball season. Please check with your coach for your team’s specific photo time on Saturday. To make it easier for parents, here is the ORDER FORM and SALE ITEMS you can download in advance of your picture day appointment. Youth lacrosse is a spring sport in Northern Virginia with teams beginning to form soon. Annandale Youth Lacrosse assessments begin January 30th — these are NOT tryouts — every AYL player makes a team. Assessments allow organizers to place players with comparable skills together so they can learn lacrosse as a team. Practices are held twice a week with boys’ games on Saturdays and girls’ games on Sundays. The Annandale program serves girls in grades K-8 and boys from ages U-9 (up to 9 yrs old) to U-15. You can register now on the Annandale Youth Lacrosse website at annandalelacrosse.org. Do you have questions about playing lacrosse? Email us at: info@annandalelacrosse.org. JEB Stuart student Anna Heilferty is a finalist for “Goal of the Year,” a competition sponsored by the U.S. Youth Soccer organization. Heilferty’s team, Annandale United FC, affiliated with the Annandale Boys and Girls Club, played a State Cup game on Stuart’s turf field, and she scored “a breathtaking 27-yard screamer of a goal,” says soccer parent Anthony Beverina. Beverina submitted a video of the goal [embedded above] to US Youth Soccer, and Heilferty’s goal made it to the top five. Whoever gets the most votes from the public will be the winner. Vote here. Voting closes Jan. 11, 1 p.m., and the winner will be announced Jan. 15. “Annandale United FC is one of the best girls club soccer team to every come out of our area,” says Beverina, whose daughter Chloe is Heilferty’s best friend and one of three Stuart students on the team. The Annandale Boys’ & Girls’ Club is still selling nursery grown, freshly cut Christmas trees from our lot on Beauregard Street. The lot is located across the street from the Plaza of Landmark Shopping Center on Little River Turnpike, just west of Route 395. The selection of Fraser Fir, Colorado Blue Spruce, Scotch Pine,ConColor Fir and Norway Spruce is big and the prices are right. Every dollar we receive will be going to a worthy cause. Sign up now and receive the Early-Bird discount. Assessments Schedule – As always we begin our season with skills assessments so we can be sure each AYL player is placed on the best team possible to ensure a fun and successful Spring season for everyone. This isn’t a tryout…every registered player makes a team! Assessments will begin Saturday, January 30th with practices beginning in February and our games running March thru the playoffs in the first week of June. We’re looking to another terrific season of lacrosse at Annandale! Two of the busiest shopping days of the year are coming up! Did you know your holiday dollars can serve double-duty? Sign up for Amazon Smile and a part of your purchase will come back to the Annandale Boys and Girls Club as a donation, helping us continue to serve youth in our community who can’t afford to pay for youth athletics. On your first visit to AmazonSmile (smile.amazon.com), you need to select Annandale Boys and Girls Club (ABGC) from the non-profit menu of choices to receive donations from eligible purchases before you begin shopping. Amazon will remember your selection, and then every eligible purchase you make at smile.amazon.com will result in a donation.